What a dream I had! Disillusionment, sour and abrasive in the nervous system, sings heart-stopping laments when it seeps past the veil. To whom is it blameful to seek to evade the laceration of grief? A fall into a bramble of thorns is not cool rippling breeze. Your obstacles broke our shins and hobbled our walks. Looking around us now, we face among ourselves a class that is rising in biliousness and wrath. I don’t see in its rebellion a struggle against the restrictions of the reality principle. It bears the insufferable marks of grim authoritarianism. It marks out who rises and who falls, who is protected and saved, and who is expelled, ignored, jailed, or drowned. The small, meek, reduced and bare lives. We should not speak for privilege, but against it. It’s not renunciation of the reality principle that we need, but renunciation of some stuffy privileged membership. What do you see, what am I asking you to see, here below? 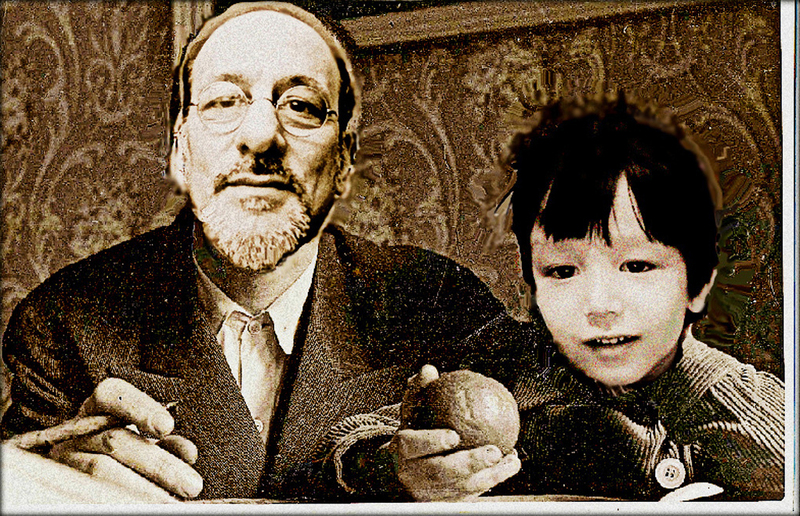 Brian and Rui – Faces of love superimposed on a 1931 photograph of Bertolt and Stefan Brecht taken by Sergei Tretiiakov in Berlin. I very, very often have dream images like this one above, with odd sing-songy rhymes in my head as I wake up each day in this long hottest of all summers, in 2018. I’m posting my indelible love for Rui despite the madness, distance, and long, silent, spatial and temporal horrors. But that’s not all. The picture on which I superimposed our faces is one that Brecht’s friend and comrade Sergei Tretiakov took of him and his son when they lived in Berlin, immediately prior to Hitler’s taking of the German Chancellorship and the final run-up/ run-down to the end of social rights, workers’ rights and democratic rights in Germany in 1933-34. Look into my eyes. See what you are. See what I see. Look into my eyes, now. See what you are. See what I see. Look into my eyes now. Let me look into yours. It’s time to leave your prison. It’s time that you go free. Look into my eyes. Love… See yourself in me. And forgive me. Let me love you. Let me take your place. Let me free you. Look, Love… Let me end with you. Rui, my heart is enclosed in amber. It still waits for us. Some beautiful poetry here, so sad.